Hi! Hope you are having a great last day of the month! I am and can’t believe it’s the end of August!! Today’s word is Dangerous for our photo challenge. It is dangerous to leave a boy along in a room with a read marker. Here is a photo of what happened at our house three years ago. 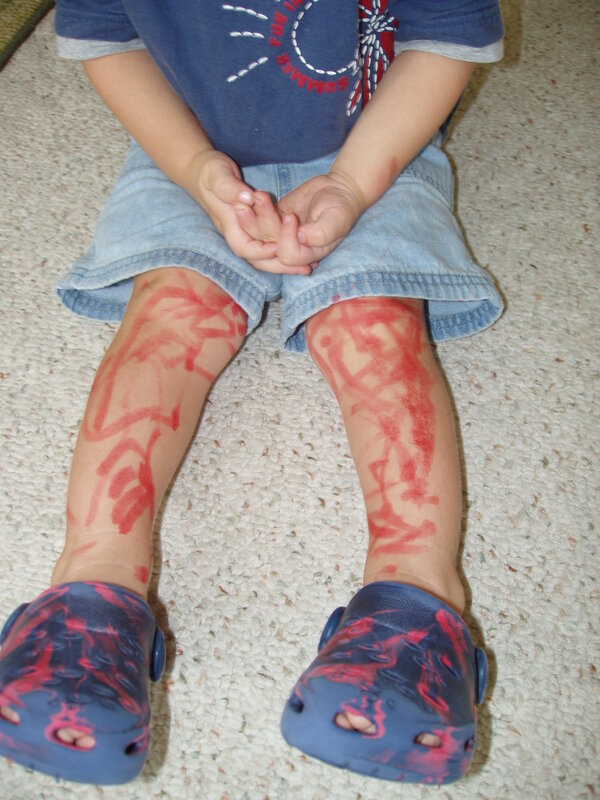 Thankfully the red was only on his legs and nothing else in the room. It took several baths and lots of scrubbing to clean it off him. And, he was in some trouble for a little while. I don’t know about you but I am so ready for the three-day weekend. Ian will be home from school on Monday so that should be fun. Today’s photo challenge is Cluttered. Unfortunately around my house, there is plenty to use for this photo. Since we have been gone for half the time over the last two years, we have had many piles of clutter build up. Now that I am home more regularly, I will be able to work my way this stuff! Yeah! Here is a picture of the top of my file cabinets in our home office. This is the tip of the iceberg. I look forward to the time to work my way through all of our stuff. This includes toys and clothes of Ian’s from his younger years. I just have to figure out what to do with all of it. Happy weekend and happy de-cluttering! 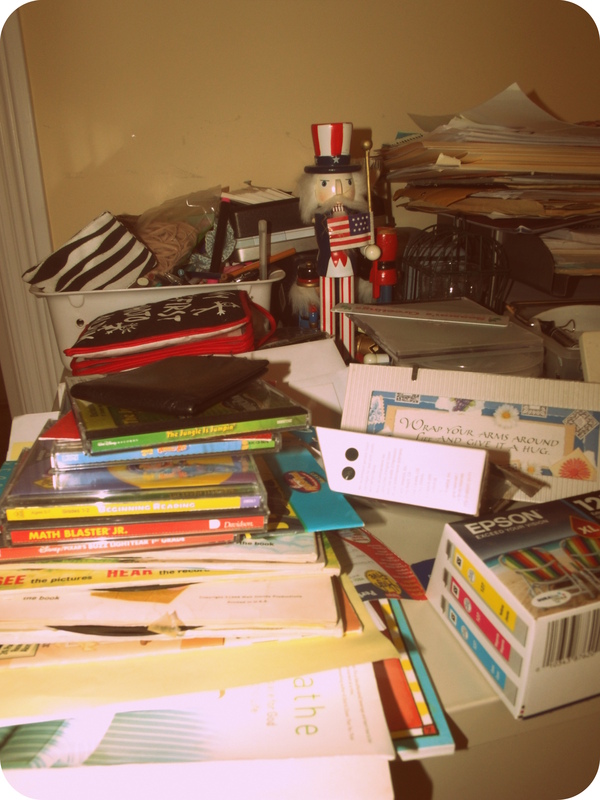 I wonder if I will make any more piles of clutter this weekend? I am going to try not to, but instead work through some. Hi and Happy Thursday. Can you believe that, counting today, there are only three days left of August? Where did this month go? It flew by, that’s for sure. For today, I decided to take a break from the Photo-A-Day Challenge and instead post an old photo. I haven’t done Throwback Thursday for a while and thought it’d be fun. 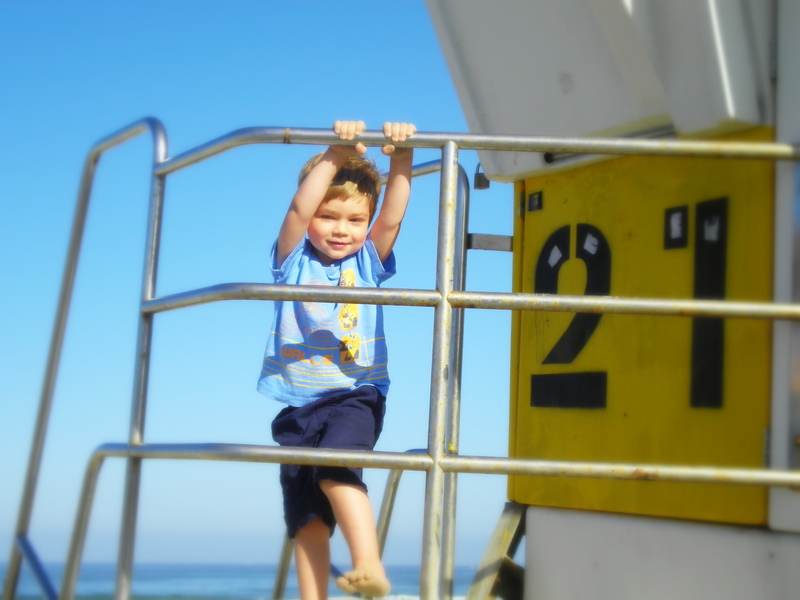 Here is Ian a few years ago at Tower 21 at our favorite beach. He was having fun on the tower at sunset. I love that he is in motion. And, I love how happy and at peace he seems to be. I don’t know what he was looking it but it seems to be something he liked. And, I love the gorgeous blue sky behind him and just a hint of the ocean in the background. And, did you notice how nicely his outfit blends? We couldn’t have planned that if we tried! He has grown up at this beach and loves it as much as I do. We have so many very special memories, and so many pictures too. I wonder when we will be back to Tower 21? I also wonder how different a picture will look it we stage this again? Since he has grown and changed since this was taken, I imagine it will look quite different. Can’t wait! Today’s challenge is Corridor, or hallway. Ian walks down a long one to get to his classroom, but I didn’t have the camera with me this morning. So I decided to use an outdoor corridor. This is a long deck along the back of a house we visited. It is pretty and I think gets the idea. Today’s photo challenge was 10 minutes from home. I live in the center of my town so, by car, can get a lot of places within 10 minutes. I decided to take a photo of something that I could walk to instead. 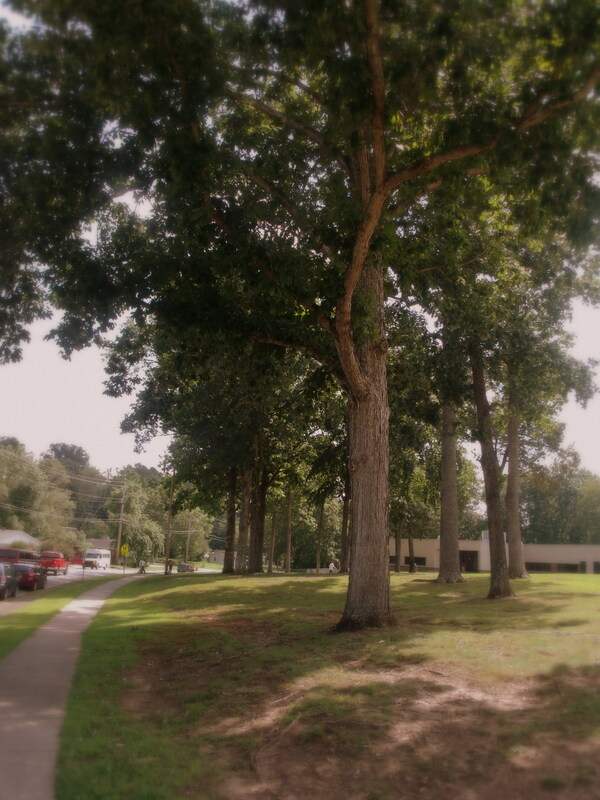 Here is the front lawn of a school that is 10 to 15 minutes walking distance away from us. I think the trees are pretty and quite large. They have lots of shade. What’s 10 minutes from you? Today’s photo challenge is Entrance. 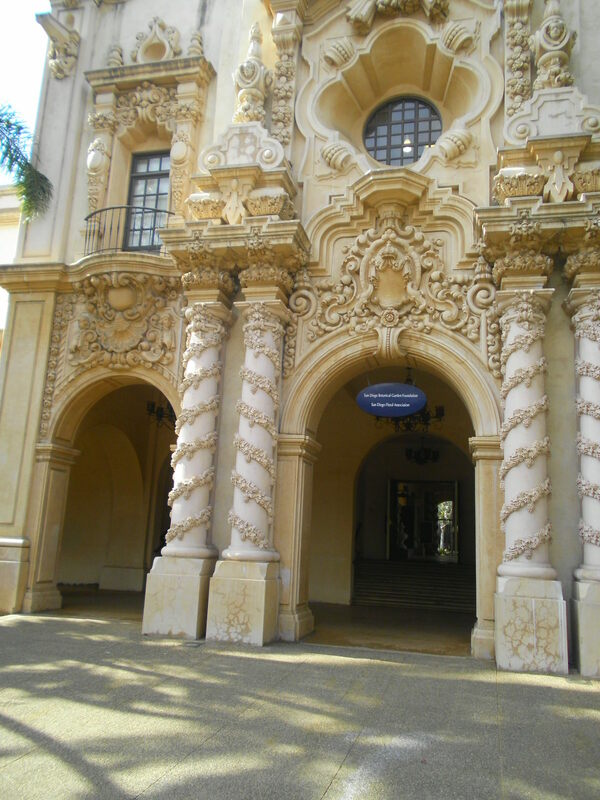 For this photo I chose one of the many gorgeous buildings in Balboa Park. I only wish I could remember which building this is. This park is in San Diego. 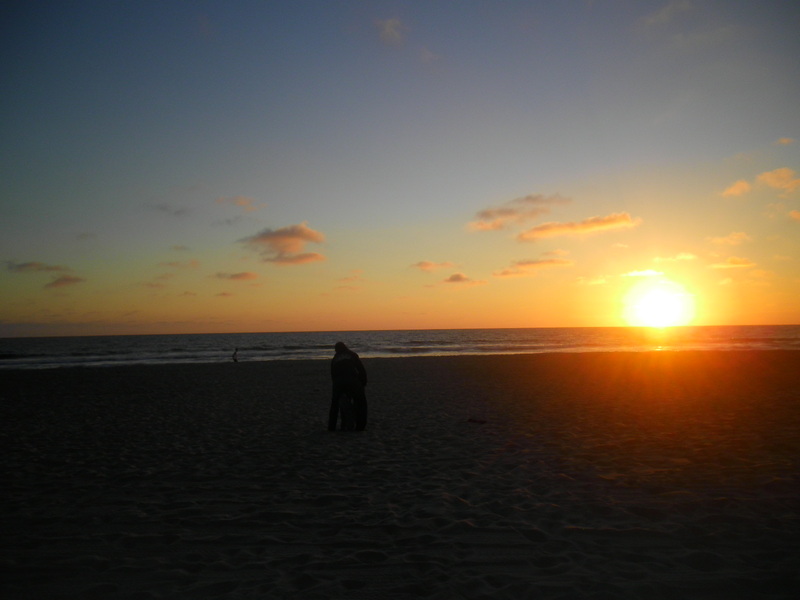 It includes numerous museums, restaurants, and the San Diego Zoo. There also is an amazing organ pavilion, grounds to walk on or enjoy a picnic, and many pathways. A friend of mine who is a photographer has taken numerous shots in this park. For that matter, so have I through the years. Many of the buildings were built for the 1915 Panama-California Exposition. A few of my favorite museums are the San Diego Model Railroad Museum, the San Diego Air and Space Museum, and the San Diego Natural History Museum. Last summer, we went to the railroad museum and Ian loved it! If you are ever in San Diego, I recommend you check out this amazing park. To read more about it, please check out the web site http://www.balboapark.org/. I wonder what other cool entrances I will see today? Should be fun to find out. Today’s photo challenge is culture. I didn’t know exactly what to do with this photo. I even looked up the definition to get some ideas. 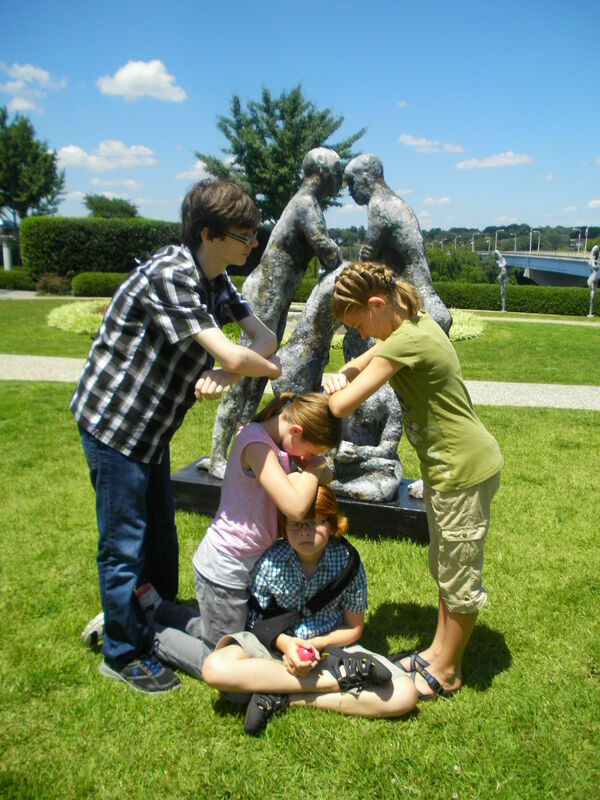 Then I remembered that my family and I last spring had gone to a sculpture garden. While we were looking around the garden, my nieces and nephews decided to pose like one of the statues. I think they did a great job. How about you? May you have a great Sunday full of culture as well as fun! Yeah, it’s Saturday. Don’t you just love Saturdays? I do since we don’t have to get up for school. But instead can be in our pjs as long as we want! Or get up and start moving. It’s our day of the week to just be and see what happens. One thing today is my photos and blogging. I think some of the best background shots are of sunsets. Last summer I took these on the same night. The first is as the sun was still on the horizon and before it had set. 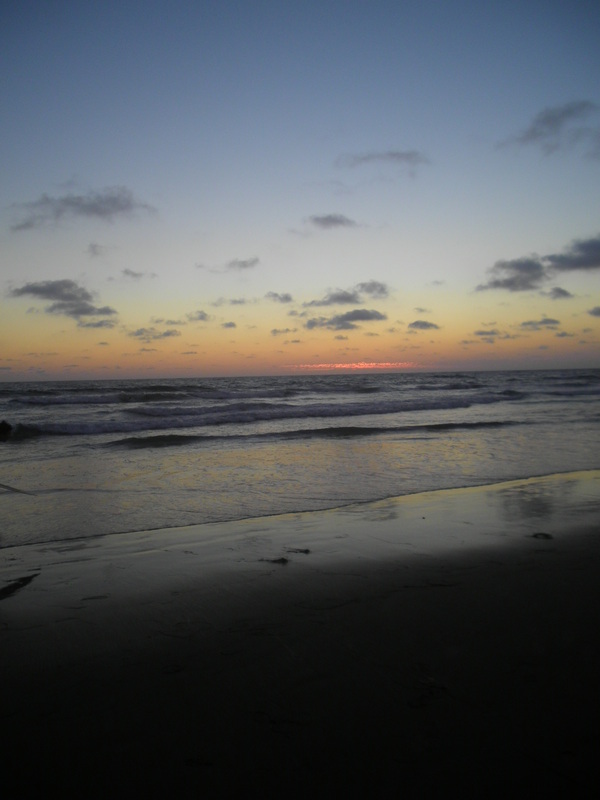 in the second one below, you can see just a sliver left of the sun as it dips into the horizon. I love sunsets and love taking pictures of them. I imagine I probably have thousands (literally) of sunset pictures. To me, they never get old. I wonder what your background photo choice would be? Please share with me and my readers. And, have a great rest of the weekend! Today for the photo challenge, we are to take a picture of something yellow. Yellow is a great color and my sister’s favorite. Yellow makes me think of smiley faces, the sun, daffodils, and submarines (from the Beatles song, “Yellow Submarine”). The inside walls of our house are a very pale yellow. This color with the white trim brightens each room. I decided to post two photos of yellow things since I couldn’t think of just one. The first is a yellow flower grown by a family friend. 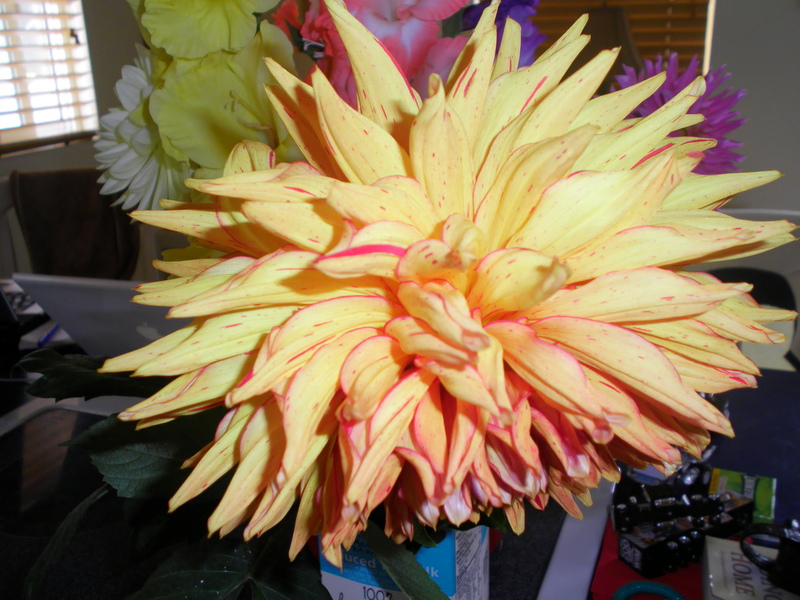 He shows dahlias in competitions. It’s beautiful, isn’t it? 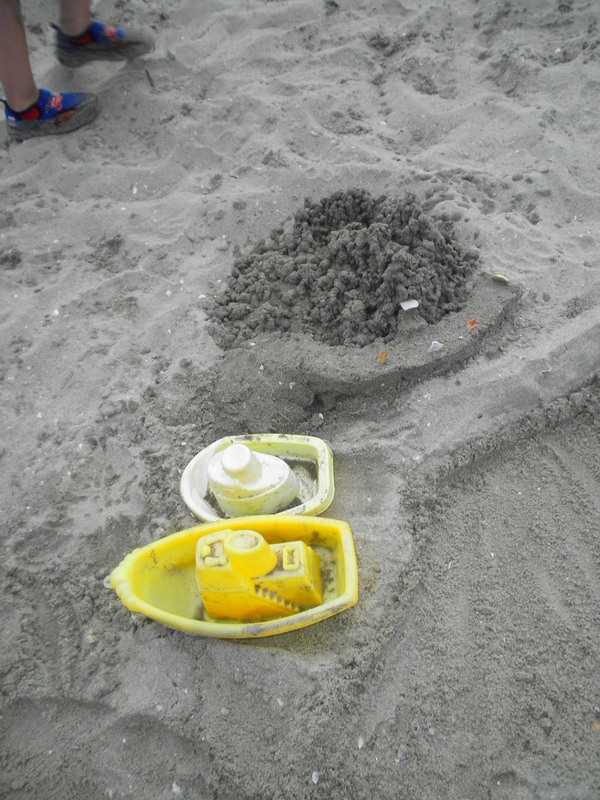 The next is a small fort we built out of sand and had two yellow boats to pose with it. For the photo a day challenge, it is a charity prompt. On Friday the 23rd of August, people all around Australia buy Daffodils and wear yellow to support Daffodil Day. It’s a day where they grow hope, and raise money to support research and treatments so we can hopefully live in a cancer-free world – quoted from Fat Mum Slim’s Photo-A-Day Photo Challenge Web site. In the town I grew up in, each spring the Daffodil Man would come downtown and sell his flowers. You always knew that spring had sprung when you saw him. May you have a great Friday and enjoy all yellow things you see today. Today’s photo challenge is Room. I am fortunate to like and use all of the rooms in my house. The house we had before had a few rooms that we never used. I am glad that we have just the right fit for us now. My kitchen is a favorite since I love to cook there with my husband and son. I also like our den where we can exercise or curl up in comfy chair to read. I honestly could say something nice about each and every room in the house. That to me is a real blessing. I also like other rooms. The one at my grandparent’s house was always a favorite! I remember the color of paint on the walls, the pictures they had hanging, and their favorite chairs. And I remember family singalongs where my aunt played the piano. Another room that I have many fond memories of is the main room at the beach house. It is tiny but has never felt that way. I suppose it is because so many memories were made there. 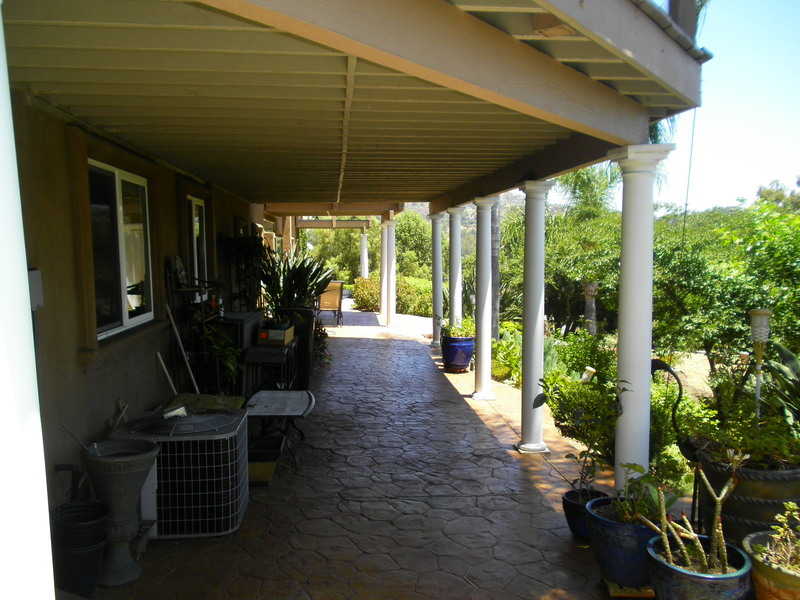 That house also has a wonderful front porch where we eat our meals. Although outside, it has been another room and has a fantastic view of the ocean! And the dining room at my parent’s house is special because of all the great meals and conversation we have with family and friends. Sitting around the table and sharing our day has been great, or sitting at the table in the kitchen. Ian went from a high chair to sitting in a regular chair at this house and the others. I like rooms that I am comfortable in. It is fun to spend time with family and friends in these rooms. I also like rooms on vacation or outside rooms with a view. That is the picture I chose today. 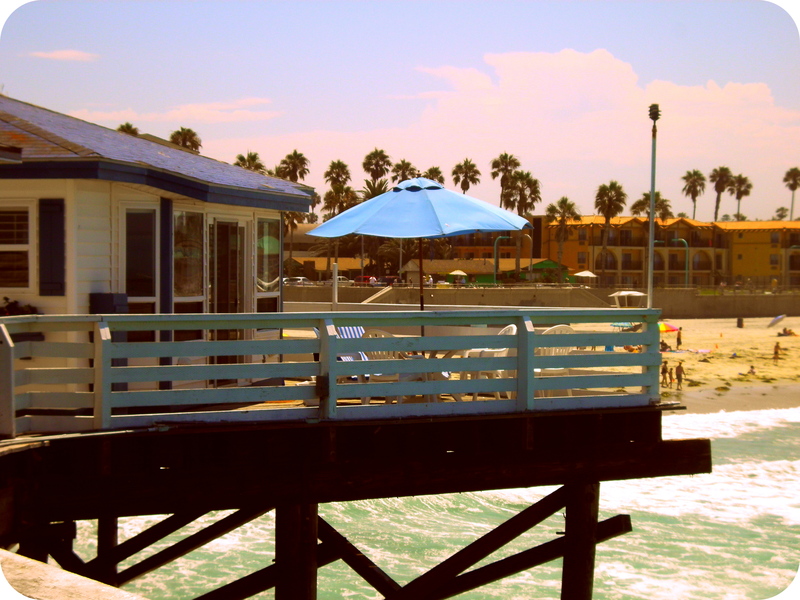 It is a deck from a small cottage on a pier. I haven’t stayed there but sure liked the looks of it. Isn’t the view amazing? I took this at the beach last summer. I can just imagine having coffee in the morning while watching the surfers or having a candlelight dinner after watching the sun go down. Ah… room. I am blessed to have so many rooms in my life. I wonder if I can appreciate each room I will be in today? I will plan to do just that.